In this subtext of the series we expand on a tie between respiration and glycolysis, and the functioning of the mitochondrion to discover the key role played by oxidative phosphorylation, “acetyl coenzyme A, and electron transport. This was crucial to understanding cellular energetics, which explains the high energy of fatty acid catabolism from stored adipose tissue, and the criticality of the multi-step sequence of reactions in energy transfer. Just at the beginning, when phosphorylation of proteins is presented, I assume you must mention that some proteins are activated by phosphorylation. This is fundamental in order to present self –organization reflex upon fast regulatory mechanisms. This poiny needs further clarification, but he makes important observations here. Even from an historical point of view. The first observation arrived from a sample due to be studied on the following day of glycogen synthetase. It was unintended left overnight out of the refrigerator. The result was it had changed from active form of the previous day to a non-active form. The story could have being finished here, if the researcher did not decide to spent this day increasing substrate levels (it could be a simple case of denaturation of proteins that changes its conformation despite the same order of amino acids). He kept on trying and found restoration of maximal activity. This assay was repeated with glycogen phosphorylase and the result was the opposite it increases its activity. increases glycogen phosphorylation as long as AMP levels are high). PK I, PKII and PKIII of M. Rouxii and Sutherland route to cAMP failed in this case. (Nathan O. Kaplan discovery) indicating this as his idea. The reason was my “chief” (SP) more than once, said to me: “Leave these great ideas for the Houssay, Leloir etc…We must do our career with small things. ” However, as she also had a faulty ability for recollection she also used to arrive some time later, with the very same idea but in that case, as her idea. glycosylation that explains the changes in the isoenzymes with the same molecular weight preserved. show in detail with different colors what carbons belongs to CoA a huge molecule, in comparison with the single two carbons of acetate that will produce the enormous jump in energy yield in comparison with anaerobic glycolysis. The idea is how much must have being spent in DNA sequences to build that molecule in order to use only two atoms of carbon. Very limited aspects of biology could be explained in this way. In case we follow an alternative way of thinking, it becomes clearer that proteins were made more stable by interaction with other molecules (great and small). Afterwards, it rather easy to understand how the stability of protein-RNA complexes where transmitted to RNA (vibrational +solvational reactivity stability pair of conformational energy). Latter, millions of years, or as soon as, the information of interaction leading to activity and regulation could be found in RNA, proteins like reverse transcriptase move this information to a more stable form (DNA). In this way it is easier to understand the use of CoA to make two carbon molecules more reactive. Every day, we build bones, move muscles, eat food, think, and perform many other activities with our bodies. All of these activities are based upon chemical reactions. However, most of these reactions are not spontaneous (i.e., they are accompanied by a positive change in free energy, DG>0) and do not occur without some other source of free energy. Hence, the body needs some sort of “free-energy currency,” (Figure 1) a molecule that can store and release free energy when it is needed to power a given biochemical reaction. How does the body “spend” free-energy currency to make a nonspontaneous reaction spontaneous? The answer, which is based on thermodynamics, is to use coupled reactions. How is food used to produce the reducing agents (NADH and FADH2) that can regenerate the free-energy currency? The answer, from biology, is found in glycolysis and the citric-acid cycle. How are the reducing agents (NADH and FADH2) able to generate the free-energy currency molecule (ATP)? Once again, coupled reactions are key. What mechanism does the body use to couple the reducing agent reactions and the generation of ATP? ATP is synthesized primarily by a two-step process consisting of an electron-transport chain and a proton gradient. This process is based on electrochemistry and equilibrium, as well as thermodynamics. ATP is the most important “free-energy-currency” molecule in living organisms (see Figure 2, below). Adenosine triphosphate (ATP) is a useful free-energy currency because the dephosphorylation reaction is very spontaneous; i.e., it releases a large amount of free energy (30.5 kJ/mol). Thus, the dephosphorylation reaction of ATP to ADP and inorganic phosphate (Equation 3) is often coupled with nonspontaneous reactions (e.g., Equation 2) to drive them forward. The body’s use of ATP as a free-energy currency is a very effective strategy to cause vital nonspontaneous reactions to occur. 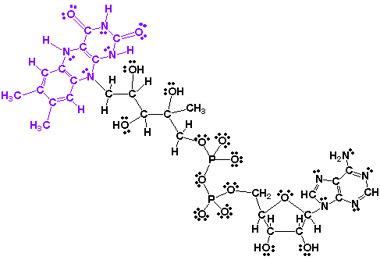 This is the two-dimensional (ChemDraw) structure of ATP, adenosine triphosphate. The removal of one phosphate group (green) from ATP requires the breaking of a bond (blue) and results in a large release of free energy. Removal of this phosphate group (green) results in ADP, adenosine diphosphate. This flowchart shows that the energy used by the body for its many activities ultimately comes from the chemical energy in our food. The chemical energy in our food is converted to reducing agents (NADH and FADH2). These reducing agents are then used to make ATP. ATP stores chemical energy, so that it is available to the body in a readily accessible form. The structures of the important molecules in Equations 5-7 are shown in Table 1, below. How is Food Used to Make the Reducing Agents Needed for the Production of ATP? To make ATP, energy must be absorbed. This energy is supplied by the food we eat, and then used to synthsize two reducing agents, NADH and FADH2 that are needed to produce ATP. One of the principal energy-yielding nutrients in our diet is glucose (see structure in Table 1 in the blue box below), a simple six-carbon sugar that can be broken down by the body. When the chemical bonds in glucose are broken, free energy is released. The complete breakdown of glucose into CO2 occurs in two processes: glycolysis and the citric-acid cycle. The reactions for these two processes are shown in the blue box below. two-dimensional representations of several important molecules in Equations 5-7. As seen in Equations 5-7 in the blue box, glycolysis and the citric-acid cycle produce a net total of only four ATP or GTP molecules (GTP is an energy-currency molecule similar to ATP) per glucose molecule. This yield isfar below the amount needed by the body for normal functioning, and in fact is far below the actual ATP yield for glucose in aerobic organisms (organisms that use molecular oxygen). For each glucose molecule the body processes, the body actually gains approximately 30 ATP molecules! (See Figure 4, below.) So, how does the body generate ATP? The process that accounts for the high ATP yield is known as oxidative phosphorylation. A quick examination of Equations 5-7 shows that glycolysis and the citric-acid cycle generate other products besides ATP and GTP, namely NADH and FADH2 (blue). These products are molecules that are oxidized (i.e., give up electrons) spontaneously. The body uses these reducing agents (NADH and FADH2) in an oxidation-reduction reaction . As you will see later in this tutorial, it is the free energy from these redox reactions that is used to drive the production of ATP. This flowchart shows the major steps involved in breaking down glucose from the diet and converting its chemical energy to the chemical energy in the phosphate bonds of ATP, in aerobic (oxygen-using) organisms. Note: In this flowchart, red denotes a source of carbon atoms (originally from glucose),green denotes energy-currency molecules, and blue denotes the reducing agents that can be oxidized spontaneously. In the discussion above, we see that glucose by itself generates only a tiny amount of ATP. However, during the breakdown of glucose, a large amount of NADH and FADH2 is produced; it is these reducing agents that dramatically increase the amount of ATP produced. How does this work? How are the reducing agents (NADH and FADH2) able to generate the free-energy currency molecule (ATP)? As discussed in an earlier section about coupling reactions, ATP is used as free-energy currency by coupling its (spontaneous) dephosphorylation (Equation 3) with a (nonspontaneous) biochemical reaction to give a net release of free energy (i.e., a net spontaneous reaction). Coupled reactions are also used to generate ATP by phosphorylating ADP. The nonspontaneous reaction of joining ADP to inorganic phosphate to make ATP (Equation 8, below, and Figure 2, above) is coupled to the oxidation reaction of NADH or FADH2 (Equation 9, below). (Recall, NADH and FADH2 are produced in glycolysis and the citric-acid cycle as described in the blue box). For simplicity, we shall henceforth discuss only the oxidation of NADH; FADH2 follows a very similar oxidation pathway. The oxidation reaction for NADH has a larger, but negative, DG than the positive DG required for the formation of ATP from ADP and phosphate. This set of coupled reactions is so important that it has been given a special name: oxidative phosphorylation. This name emphasizes the fact that an oxidation (of NADH) reaction (Equation 9 and Figure 5, below) is being coupled to a phosphorylation (of ADP) reaction (Equation 8, below, and Figure 2, above). In addition, we must consider the reduction reaction (gaining of electrons) that accompanies the oxidation of NADH. (Oxidation reactions are always accompanied by reduction reactions, because an electron given up by one group must be accepted by another group.) In this case, molecular oxygen (O2) is the electron acceptor, and the oxygen is reduced to water (Equation 10, below) . The net reaction is obtained by summing the coupled reactions, as shown in Equation 11, below. 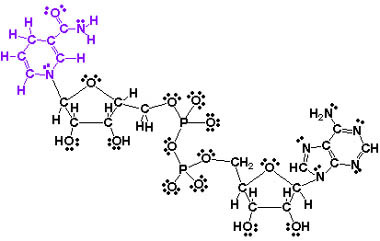 This is a two-dimensional (ChemDraw) representation showing the change that occurs when NADH is oxidized to NAD+. “R” represents the part of the structure that is shown in black in the drawing of NADH in Table 1, and does not change during the oxidation half-reaction. The molecular changes that occur upon oxidation are shown in red. In this tutorial, we have seen that nonspontaneous reactions in the body occur by coupling them with a very spontaneous reaction (usually the ATP reaction shown in Equation 3). We have just seen that ATP is produced by coupling the phosphorylation reaction with NADH oxidation (a very spontaneous reaction). But we have not yet answered the question: by what mechanism are these reactions coupled? Every day your body carries out many nonspontaneous reactions. As discussed earlier, if a nonspontaneous reaction is coupled to a spontaneous reaction, as long as the sum of the free energies for the two reactions is negative, the coupled reactions will occur spontaneously. How is this coupling achieved in the body? Living systems couple reactions in several ways, but the most common method of coupling reactions is to carry out both reactions on the same enzyme. Consider again the phosphorylation of glycerol (Equations 2-4). Glycerol is phosphorylated by the enzyme glycerol kinase, which is found in your liver. The product of glycerol phosporylation, glycerol-3-phosphate (Equation 2), is used in the synthesis of phospholipids. Glycerol kinase is a large protein comprised of about 500 amino acids. X-ray crystallography of the protein shows us that there is a deep groove or cleft in the protein where glycerol and ATP attach (see Figure 6, below). 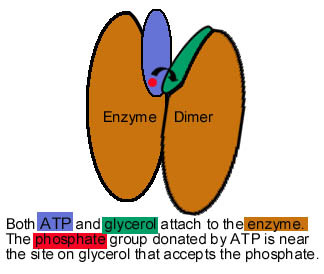 Because the enzyme holds the ATP and the glycerol in place, the phosphate can be transferred directly from the ATP to glycerol. Instead of two separate reactions where ATP loses a phosphate (Equation 3) and glycerol picks up a phosphate (Equation 2), the enzyme allows the phosphate to move directly from ATP to glycerol (Equation 4). The coupling in oxidative phosphorylation uses a more complicated (and amazing!) mechanism, but the end result is the same: the reactions are linked together, the net free energy for the linked reactions is negative, and, therefore, the linked reactions are spontaneous. Neglecting any differences in difficulty synthesizing or accessing these molecules by biological systems, rank the molecules in order of their efficiency as a free-energy currency (i.e., the amount of nonspontaneous reactions enabled per phosphate removed from a molecule of free-energy currency) from the most efficient to the least efficient. In order to couple the redox and phosphorylation reactions needed for ATP synthesis in the body, there must be some mechanism linking the reactions together. In cells, this is accomplished through an elegant proton-pumping system that occurs inside special double-membrane-bound organelles (specialized cellular components) known as mitochondria. A number of proteins are required to maintain this proton-pumping system and catalyze the oxidative and phosphorylation reactions. (c) the synthesis of ATP using energy from the spontaneous diffusion of electrons down the proton gradient generated in step (b). Note: Steps (a) and (b) show cytochrome oxidase, the final electron-carrier protein in the electron-transport chain described above. 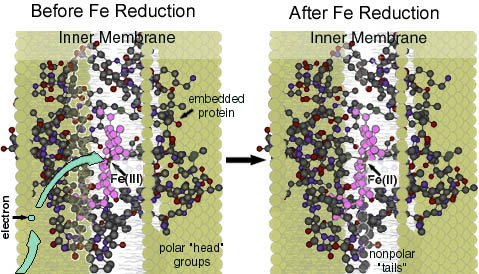 When this protein accepts an electron (green) from another protein in the electron-transport chain, an Fe(III) ion in the center of a heme group (purple) embedded in the protein is reduced to Fe(II). The coordinates for the protein were determined using x-ray crystallography, and the image was rendered using SwissPDB Viewer and POV-Ray (see References). Cells use a proton-pumping system made up of proteins inside the mitochondria to generate ATP. Before we examine the details of ATP synthesis, we shall step back and look at the big picture by exploring the structure and function of the mitochondria, where oxidative phosphorylation occurs. This is a schematic diagram showing the membranes of the mitochondrion. The purple shapes on the inner membrane represent proteins, which are described in the section below. An enlargement of the boxed portion of the inner membrane in this figure is shown in Figure. 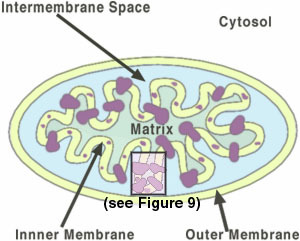 As shown in Figure 8, inside the inner membrane is a space known as the matrix; the space between the two membranes is known as the intermembrane space. The matrix side of the inner membrane has a negative electrical charge relative to the intermembrane space due to an H+ gradient set up by the redox reaction (Equations 9 and 10). This charge difference is used to provide free energy (G) for the phosphorylation reaction (Equation 8). Phosphorylation of ADP (Equation 8) is coupled to the oxidation-reduction reaction of NADH and O2 (Equations 9 and 10). Electrons are not transferred directly from NADH to O2, but rather pass through a series of intermediate electron carriers in the inner membrane of the mitochondrion. Why? This allows something very important to occur: the pumping of protons across the inner membrane of the mitochondrion. As we shall see, it is this proton pumping that is ultimately responsible for coupling the oxidation-reduction reaction to ATP synthesis. Two major types of mitochondrial proteins (see Figure 9, below) are required for oxidative phosphorylation to occur. Both classes of proteins are located in the inner mitochondrial membrane. The electron carriers (NADH-Q reductase, ubiquinone (Q), cytochrome reductase, cytochrome c, and cytochrome oxidase shown in shades of purple in Figure 9 below) transport electrons in a stepwise fashion from NADH to O2. Three of these carriers (NADH-Q reductase, cytochrome reductase, and cytochrome oxidase) are also proton pumps, and simultaneously pump H+ ions (protons) from the matrix to the intermembrane space. (Proton movement from one side of the membrane to the other is shown as blue arrows in Figure 9, below.) The protons that are pumped across the membrane complete the redox reaction (Equations 9 and 10). The creation of a proton gradient across the membrane is one way of storing free energy. The electron carriers can be divided into three protein complexes (NADH-Q reductase (1), cytochrome reductase (3), and cytochrome oxidase (5)) that pump protons from the matrix to the intermembrane space, and two mobile carriers (ubiquinone (2) and cytochrome c (4)) that transfer electrons between the three proton-pumping complexes. (Gold numbers refer to the labels on each protein in Figure 9, below.) Because electrons move from one carrier to another until they are finally transferred to O2, the electron carriers (shown in Figure 9,below) are said to form an electron-transport chain. This is a schematic diagram illustrating the transfer of electrons from NADH, through the electron carriers in the electron transport chain, to molecular oxygen. Please click on the pink button below to view a QuickTime animation of the functions of the proteins embedded in the inner mitochondrial membrane that are necessary for oxidative phosphorylation. Click the blue button below to download QuickTime 4.0 to view the movie. 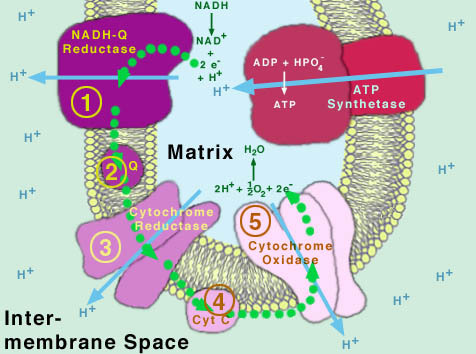 NADH-Q reductase (1), cytochrome reductase (3) , and cytochrome oxidase (5) are electron carriers as well as proton pumps, using the energy gained from each electron-transfer step to move protons (H+) against a concentration gradient, from the matrix to the intermembrane space.Ubiquinone (Q) (2) and cytochrome c (Cyt C) (4) are mobile electron carriers. (Ubiquinone is not actually a protein.) All of the electron carriers are shown in purple, with lighter shades representing increasingly higher reduction potentials. Together, these electron carriers form a “chain” to transport electrons from NADH to O2. The path of the electrons is shown with the green dotted line. ATP synthetase (red) has two components: a proton channel (allowing diffusion of protons down a concentration gradient, from the intermembrane space to the matrix), and a catalytic component to catalyze the formation of ATP. For a more complete description of each step in oxidative phosphorylation (indicated by the gold numbers), click here. Click here for a brief description of each of the electron carriers in the electron-transport chain. It is important to note that, although NADH donates two electrons and O2 ultimately accepts four electrons, each of the carriers can only transfer one electron at a time. Hence, there are several points along the chain where electrons can be collected and dispersed. For the sake of simplicity, these points are not described in this tutorial. In the section above, we see that the oxidation-reduction process is a series of electron transfers that occurs spontaneously and produces a proton gradient. Why are the electron tranfers from one electron carrier to the next spontaneous? What causes electrons to be transferred down the electron-transport chain? As seen in Table 2, below, and Figure 7a, in these carriers, the species being oxidized or reduced is Fe, which is found either in a iron-sulfur (Fe-S) group or in a heme group. (Recall the heme group from the Chem 151 tutorial “Hemoglobin and the Heme Group: Metal Complexes in the Blood“.) The iron in these groups is alternately oxidized and reduced between Fe(II) (reduced) or Fe(III) (oxidized) states. Table 2 shows that the electrons are transferred through the electron-transport chain because of the difference in the reduction potential of the electron carriers. As explained in the green box below, the higher the electrical potential (e) of a reduction half reaction is, the greater the tendency is for the species to accept an electron. Hence, in the electron-transport chain, electrons are transferred spontaneously from carriers whose reduction results in a small electrical potential change to carriers whose reduction results in an increasingly larger electrical potential change. For example, for the overall reaction of the oxidation of NADH paired with the reduction of O2, the potential can be calculated as shown below. Hence the overall reaction for the oxidation of NADH paired with the reduction of O2 has a negative change in free energy (DG =-220 kJ); i.e., it is spontaneous. Thus, the higher the electrical potential of a reduction half reaction, the greater the tendency for the species to accept an electron. Just as in the box above, the electrical potential for the overall reaction (electron transfer) between two electron carriers is the sum of the potentials for the two half reactions. As long as the potential for the overall reaction is positive the reaction is spontaneous. Hence, from Table 2 below, we see that cytochrome c1 (part of the cytochrome reductase complex, #3 in Figure 9) can spontaneously transfer an electron to cytochrome c (#4 in Figure 9). The net reaction is given by Equation 16, below. Table 2 lists the reduction potentials for each of the cytochrome proteins (i.e., the last three steps in the electron-transport chain before the electrons are accepted by O2) involved in the electron-transport chain. Note that each electron transfer is to a cytochrome with a higher reduction potential than the previous cytochrome. As described in the box above and seen in Equations 14-19, an increase in potential leads to a decrease in DG (Equation 13), and thus the transfer of electrons through the chain is spontaneous. To view the cytochrome molecules interactively using RASMOL, please click on the name of the complex to download the pdb file. Hence, the electron-transport chain (which works because of the difference in reduction potentials) leads to a large concentration gradient for H+. As we shall see below, this huge concentration gradient leads to the production of ATP. Briefly, explain why electrons travel from NADH-Q reductase, to ubiquinone (Q), to cytochrome reductase, rather than in the opposite direction. One result of the transfer of electrons from NADH-Q reductase down the electron transport chain is that the concentration of protons (H+ ions) in the intermembrane space is increased. Could cells move protons (H+ ions) from the matrix to the intermembrane space without transporting electrons? Why or why not? We have seen that the electron-transport chain generates a large proton gradient across the inner mitochondrial membrane. But recall that the ultimate goal of oxidative phosphorylation is to generate ATP to supply readily-available free energy for the body. How does this occur? 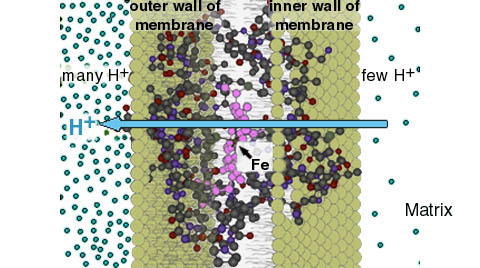 In addition to the electron-carrier proteins embedded in the inner mitochondrial membrane, a special protein called ATP synthetase (Figure 9, the red-colored protein) is also embedded in this membrane. ATP synthetase uses the proton gradient created by the electron-transport chain to drive the phosphorylation reaction that generates ATP (Figure 7c). ATP synthetase is a protein consisting of two important segments: a transmembrane proton channel, and a catalytic component located inside the matrix. The proton-channel segment allows H+ ions to diffuse from the intermembrane space, where the concentration is high, to the matrix, where the concentration is low. Recall from the Kidney Dialysis tutorial that particles spontaneously diffuse from areas of high concentration to areas of low concentration. Thus, since the diffusion of protons through the channel component of ATP synthetase is spontaneous, this process is accompanied by a negative change in free energy (i.e., free energy is released). The catalytic component of ATP synthetase has a site where ADP can enter. 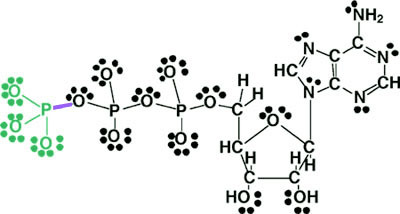 Then, using the free energy released by the spontaneous diffusion of protons through the channel segment, a bond is formed between the ADP and a free phosphate group, creating an ATP molecule. The ATP is then released from the reaction site, and a new ADP molecule can enter in order to be phosphorylated. Certain toxins allow H+ ions to move freely across the inner mitochondrial membrane (i.e., without needing to pass through the channel in ATP synthetase). What effect do you expect these toxins to have on the production of ATP? Briefly, explain your answer. In this tutorial, we have learned that the ability of the body to perform daily activities is dependent on thermodynamic, equilibrium, and electrochemical concepts. These activities, which are typically based on nonspontaneous chemical reactions, are performed by using free-energy currency. The common free-energy currency is ATP, which is a molecule that easily dephosphorylates (loses a phosphate group) and releases a large amount of free energy. In the body, the nonspontaneous reactions are coupled to this very spontaneous dephosphorylation reaction, thereby making the overall reaction spontaneous (DG < 0). 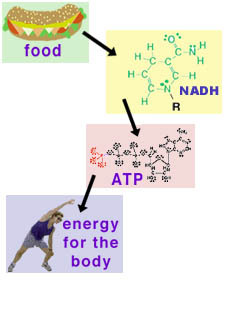 As the coupled reactions occur (i.e., as the body performs daily activities), ATP is consumed and the body regenerates ATP by using energy from the food we eat (Figure 3). As seen in Figure 4, the breakdown of glucose (glycolysis) obtained from the food we eat cannot by itself generate the large amount of ATP that is needed for metabolic energy by the body. However, glycolysis and the subsequent step, the citric-acid cycle, produce two easily oxidized molecules: NADH and FADH2. These redox molecules are used in an oxidative-phosphorylation process to produce the majority of the ATP that the body uses. 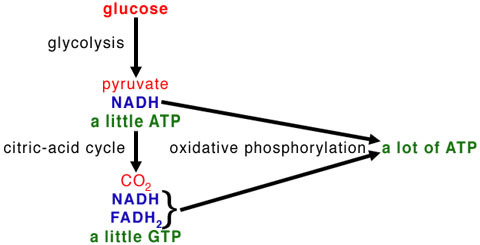 This oxidative-phosphorylation process consists of two steps: the oxidation of NADH (or FADH2) and the phosphorylation reaction which regenerates ATP. Oxidative phosphorylation occurs in the mitochondria, and the two reactions (oxidation of NADH or FADH2 and phosphorylation to generate ATP) are coupled by a proton gradient across the inner membrane of the mitochondria (Figure 9). As seen in Figures 7 and 9, the oxidation of NADH occurs by electron transport through a series of protein complexes located in the inner membrane of the mitochondria. This electron transport is very spontaneous and creates the proton gradient that is necessary to then drive the phosphorylation reaction that generates the ATP. Hence, oxidative-phosphorylation demonstrates that free energy can be easily transferred by proton gradients. Oxidative-phosphorylation is the primary means of generating free-energy currency for aerobic organisms, and as such is one of the most important subjects in the study of bioenergetics (the study of energy and its chemical changes in the biological world). This fun description of oxidative phosphorylation by Dr. E.J.Oakeley contains step-by-step animated illustrations of the redox reactions involved, as well as a quiz to test your understanding of the material. Alberts, B. et al. In Molecular Biology of the Cell, 3rd ed., Garland Publishing, Inc.: New York, 1994, pp. 653-684. Becker, W.M. and Deamer, D.W. In The World of the Cell, 2nd ed., The Benjamin/Cummings Publishing Co., Inc.: Redwood City, CA, 1991, pp. 291-307. Fasman, G.D. In Handbook of Biochemistry and Molecular Biology, 3rd ed., CRC Press, Inc.: Cleveland, OH, 1976, Vol. I (Physical and Chemical Data), pp. 132-137. Guex, N. and Peitsch, M.C. Electrophoresis, 1997, 18, 2714-2723. (SwissPDB Viewer) URL: http://www.expasy.ch/spdbv/mainpage.htm. Moa, C., Ozer, Z., Zhou, M. and Uckun, F. X-Ray Structure of Glycerol Kinase Complexed with an ATP Analog Implies a Novel Mechanism for the ATP-Dependent Gylcerol Phosphorylation by Glycerol Kinase.Biochemical and Biophysical Reaearch Communications. 1999, 259, 640-644. Stryer, L. In Biochemistry, 4th. ed., W.H. Freeman and Co.: New York, 1995, pp. 490, 509, 513, 529-557. Zubay, G. Biochemistry, 3rd. ed., Wm. C. Brown Publishers: Dubuque, IA, 1983, p. 42. The authors thank Dewey Holten (Washington University in St. Louis) for many helpful suggestions in the writing of this tutorial. Excellent. José Eduardo de Salles Roselino: A granule of glycogen is a very complex structure of glycoprotein. At its core, it has two glycogenin macromolecules (a dimer of self-glycosylating protein) and the entire enzymatic machine: UDPG glycogen synthetase, branching enzyme, phosphorylase and disbranching enzyme. This example of self-assembled complex unit allows for a single signal, in the case, activated cAMP protein kinase to produce at the very same time an inhibitory signal upon glycogen synthesis and a stimulatory signal for glycogen breakdown. This would not be possible in case glycogen (the substrate) was required to diffuse from a synthetic place in the cell to another one in the cell where glycogen phosphorolysation would occur. In this case, the signal protein would produce a minus effect (decreasing synthesis) on one place and a plus effect elsewhere (glycogen breakdown). This concerted action requires self-organization. Self-organization is to some degree, derived from conformational energy Helmut Tribush and Ludwig Dohmann Science v 279 pp1891 (1998).